Each year, hundreds of millions of people flood into America’s national parks to marvel at the stunning vistas. “Troubled Edens,” the latest film by KUED’s John Howe, explores the numerous challenges facing these beloved parks. The documentary is the final installment of KUED’s Year of the Parks trilogy that celebrated the 100-year anniversary of the National Park Service. The film premieres Wednesday, March 29 at 8 p.m. on KUED. Andrea Brunelle, chair of the Department of Geography, is featured in the documentary discussing the impacts of climate change on the iconic landscapes. Brunelle sat down with @theU to talk about the future of the national parks in a warming planet. Congratulations on the documentary! How was the experience? A: It was good. I’ve done some television interviews, which I didn’t care for as much because you spend 20 or 30 minutes talking, and then they take a few of your words out of context and it’s terrible (laughs). But John [Howe, the filmmaker] did an amazing job. The whole documentary is so beautiful. A: The production visits several different national parks in the West, with a particular focus on Yellowstone and Yosemite, but also some other places here in Utah, like Arches and Zion. It explored the different challenges facing each park. I talked about the challenges presented by climate change, and the challenge of maintaining what a park is known for when changes in climate are affecting the landscapes by influencing wildfires, bark beetle outbreaks, and even the geysers in Yellowstone. 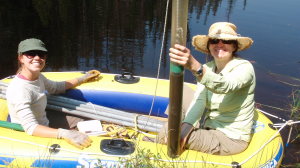 Andrea Brunelle and Vachel Carter take sediment cores from Salamander Pond to reconstruct the pine mountain beetle outbreaks over the last 12,000 years. How is climate change affecting national parks? A: National parks are chosen because they’re particularly beautiful in some way, or they have some characteristic that we wanted to preserve. In people’s mind, Yellowstone looks a certain way, Yosemite looks a certain way. With climate change, it’s not like they’re not going to be there, and they’re not going to be beautiful, but they may be different. These iconic landscapes that people imagine in their minds aren’t necessarily going to look the same. For example, in Yellowstone National Park, the geysers are changing their eruption schedules in part because of drought. Old Faithful isn’t quite as faithful because the timing is changing. With less water going into the basin to be heated, it’s erupting differently. In the film, you discuss how bark beetle outbreaks are getting worse with climate change. What are bark beetles, and how do they affect national parks? A: We’re seeing pretty significant outbreaks of bark beetles in the western United States; bark beetles like the spruce beetle, the mountain pine beetle, and the western beetle. The work that I do here at the U looks at long-term records. We take cores from lakes to reconstruct past beetle outbreaks. So far, we’ve been able to determine that the beetle outbreaks that we see today look like they’re unprecedented in the long-term record. We haven’t seen anything like this over the last 12,000 to 15,000 years. The beetles burrow into the bark and consume the phloem, which is the layer of tissue that essentially transports water and nutrients to the rest of the tree. As they’re doing this, they create little grooves in that phloem tissue. If you have enough beetles doing that, it will cut off the tree’s water-nutrient transportation, and slowly kills it. Once the trees start to die, they start to turn red, and then the needles drop off. Yosemite right now looks very different because of all the dead, red trees. So, all the vistas that people may have enjoyed when they visited the park in their youth are very different than they were 20 years ago. How is climate change making beetle infestations worse? Andrea Brunelle and former student Vachel Carter at Salamander Pond, on the north slope of the Uinta Mountains. 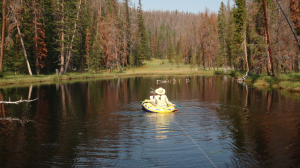 They are collecting sediment cores to reconstruct the past mountain pine beetle outbreak and fire occurrence for the last 12,000 years. The red, dead trees are evidence of the current beetle outbreak. wreaking havoc—they’ve been on the landscape. And they actually play an important role in the ecosystem because there will be an outbreak in a little pocket of trees, several trees will die, and then new trees will come up in that pocket. So, you end up with a mosaic of tree ages, which is good because then you don’t have a completely single-aged stand that’s vulnerable all at the same time. Climate change has created a combination of things that has led to a point where the trees are much more vulnerable. The beetles are now taking out swaths of forests instead of a little pocket outbreaks. A tree’s defense against the beetles is pitching out; a beetle tunnels into the tree, the tree produces sap, the beetle gets mired in the sap, and that’s the end of that. If there’s a mass attack, where there’s a lot of beetles doing that, then the tree can’t keep up. Or of the tree is drought-stressed, if it’s really dry, it doesn’t have enough moisture to produce enough sap to pitch the beetles out. They’re more vulnerable when there’s a lot of drought. Another issue is the reproductive cycle of the beetles. Previously, it would take a year or two or even longer for a beetle to go through its entire life cycle to produce another adult beetle. When it gets warm in the spring, they start doing their reproductive business, and when it gets cold enough in the winter, they go dormant and don’t open back up again until it gets warm enough in the spring. What we’re seeing with climate change is that it’s getting warmer earlier and colder later. So, beetles that used to take a year or two to go from an adult, through the entire cycle back to an adult, now they’re doing that is less time. In some cases, they’re having two full reproductive cycles in a single year. So, there are tons more beetles on the landscape then there have been historically. How do you think people will react to the film? A: I think one of the things that’s so powerful about the production is that it takes that perspective of “Troubled Edens,” these really iconic places that people have so much emotional connection to for a variety of reasons, they’re threatened to not be what we remember them being. But it’s a personal experience. It’s going to be more powerful for people who already have a vision for what it looked like, so a new visitor to the park isn’t going to know that this isn’t what it looked like 10 years ago, 20 years ago. That’s the thing we have to wrap our heads around—what are we trying to preserve? Are we trying to preserve spaces? Is it a snapshot? Do we want it to look exactly the same? That’s going to be tricky. For Troubled Eden air dates, click here. Pandas, tigers and leopards. Oh my!